Photo courtesy of IMDb. Shane Johnson gets a little devilish. 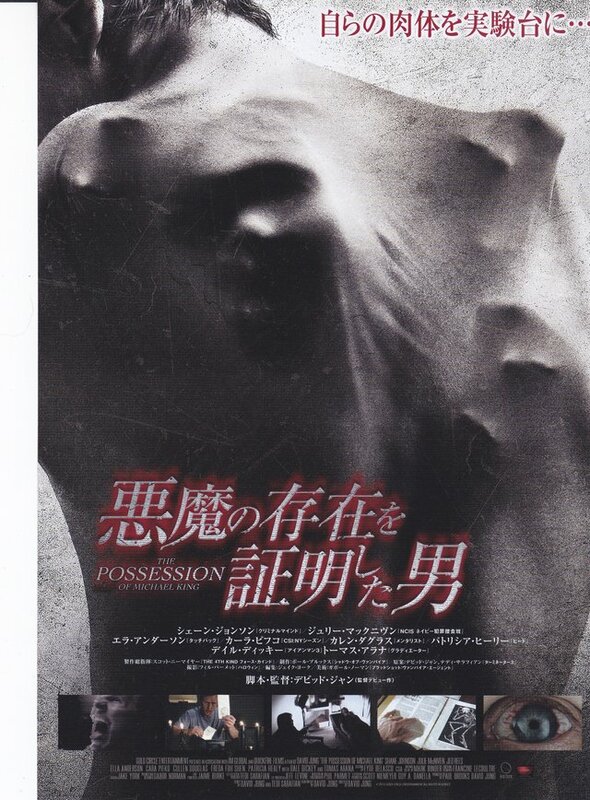 The Possession of Michael King, directed and co-written by David Jung; starring Shane Johnson, Cara Pifko, Michael Ray Escamilla, and Ella Anderson. I’d been wanting to watch this one for several years after a friend recommended it. Yesterday, I found it streaming for free on the Roku Channel, so I decided to give it a go. It was a gloomy, slightly rainy winter day, the perfect afternoon for watching a good horror movie. Michael King is a solid if unspectacular entrant to the prolific demonic possession sub-genre of horror. I’m at a loss to explain why it only has a 5.7/10 user rating from the IMDb. IMHO, it’s a very well-made film, especially for a low-budget, first effort from an unknown director. Maybe viewers are just tired of the whole demonic possession thing. This film is kind of a hybrid of a found-footage film and a regular film (if you hate found-footage, please note that it’s used very judiciously and effectively here.) Michael King resembles the first Paranormal Activity movie quite a lot—especially the set where most of the action takes place—but it has more going for it, plot wise, than that film. It’s also well-paced, well-edited, and well-acted. The film starts with clips from a sunny home movie featuring a typical happy family—mother, father, and little girl—having a picnic in a park. Later, we find that the home movie was shot on the very day that the mother (played by Cara Pifko, who also starred in a Paranormal Activity sequel) was accidentally run over and killed by a passing car. The grieving dad is Michael, the title character, played by Shane Johnson of TV’s Power series. He is, conveniently enough, a successful director of video documentaries. Michael blames the death of his wife on a psychic who told her to stay home instead of going on a vacation trip with the family. The way he deals with his grief is to make a documentary that exposes the hucksters of the murky, underground occult industry. Soon, Michael begins hearing strange voices in his head, including a voice that keeps telling him to kill his little daughter, Ellie (Ella Anderson). In short order, Jordan quits the project when Michael’s behavior creeps him out. Michael, in his lucid moments, then sets up cameras all over his house to document his own possession. 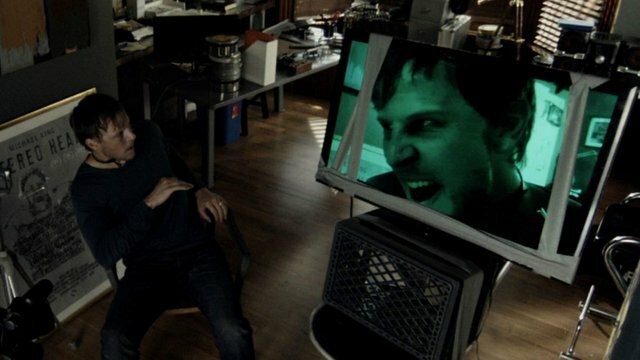 Johnson does a very good job portraying Michael’s despair as he battles the demon for possession of his own body. Although much of the demonic activity in this film is something we’ve seen before (body contortions, self-mutilation), there is one super-creepy scene where a demon-possessed Michael drugs his daughter and then molests her while she’s unconscious. This scene is definitely the movie’s kill shot, which I expect will stick with me for a long, long time. The ending finds us in familiar, cliched territory, as it owes a huge debt to the ending of The Exorcist (1973). I would have preferred a more creative ending. I would have also preferred an innovative title, as I’m pretty sick of generic horror movie titles. There are at least 10 titles in the IMDb that are The Possession of. . . (In the 70s, we had films with titles like The Blood on Satan’s Claw—where did titles like that go?) But all in all, I believe this film is more than a little worth sitting through. I give it a soft 7/10. Japanese Poster art for this movie! Yeah, they used the same image in the American poster too. Which is strange because I don't remember that image showing up in the film. Haven't seen the movie actually. But i sell these Japanese posters and often they use different graphic than the western counterpart so i thought to contribute to your post! Oh I see. Thanks for the comment! Hello @janenightshade, thank you for sharing this creative work! We just stopped by to say that you've been upvoted by the @creativecrypto magazine. The Creative Crypto is all about art on the blockchain and learning from creatives like you. Looking forward to crossing paths again soon. Steem on!